(MPI) - On December 5th, 2018, in Hanoi, the Ministry of Planning and Investment (MPI) in collaboration with the World Bank (WB) held the first annual Vietnam Reform and Development Forum (VRDF) with the theme "New Vision, New Drivers of Economic Growth in the New Era" under the co-chairman of Minister Nguyen Chi Dung and WB Country Director in Vietnam Ousmane Dione. The forum had the honor of the attendance of Prime Minister Nguyen Xuan Phuc. The throughout aims of VRDF is to further strengthen the cooperation between government agencies and the development partners community, national and international experts, and the broad participation of organizations, individuals, private economic sector, etc. to discuss relevant issues in order to put forward effective recommendations to accelerate the process of reform and development of the economy of Viet Nam. The Forum is the first step that lays development foundations to become an international and regional level reform and development Forum that contributes to the prosperity and sustainable development of not only Viet Nam, but also the region as a whole, enabling nations, including Vietnam, to effectively promote their roles in the international arena. The VRDF will help delegates, policymakers and enterprises to have a comprehensive, deep and wide understanding of the international context and massive global trends in the coming time, the new growth drivers of Vietnam, the steps and solutions to overcome the challenges, successfully seize opportunities for development and effectively promote the country's new growth drivers. In addition, the Forum will help Vietnam's development partners better understand the difficulties that Vietnam is facing and Vietnam's development priorities in the next one or two decades to identify the most suitable and effective ways of supporting and cooperating with Vietnam especially is in the context of urgently preparing important contents for the 13th National Party Congress, including the study of formulation of the 10-year Socio-Economic Development Strategy (2021-2030) and the 5-year Socio-Economic Development Plan (2020-2025). Speaking at the opening of the Forum, Minister Nguyen Chi Dung said that the Resolution of the 12th Party Congress affirmed the great policy of "Pushing up comprehensively and synchronously the innovation process; developing the economy rapidly and sustainably, and striving to soon turn our country into an industrialized nation along the line of modernity". In addition, there were many important Resolutions on institutional and legal improvement, key tasks of reform, socio-economic development, enterprise development, private economic development, human resource development, social security, etc. These require the Government to develop a set of specific solutions and actions to direct and guide the comprehensive development of various sectors of the economy, enabling the country to attain rapid and sustainable development, overcome the middle-income trap, and narrow the development gap with the rest of the world. The most significant achievement of more than 30 years of innovation has been a dramatic change of the face of Viet Nam's economy, improved people's living standards, and sharply reduced rate of poverty; Viet Nam has become a middle-income nation and has been integrating deep and wide into the global economy. Currently, the stature, position, and prestige of Viet Nam in the international arena have gradually improved, highly recognized and appreciated by the international community. Achievement of the above-mentioned positive results is thanks to unceasing efforts of the entire political system, the whole society, the business community and effective cooperation and support of the international community, development partners in particular. In the years to come, the economy of Viet Nam promises both challenges and opportunities that are intertwined. A number of economic scenarios for Viet Nam have been put forward with an expected average growth rate of 6.85% during the years of 2018-2020. Nevertheless, the Government remains constantly aware of the challenges and difficulties, both internal problems and external objective impacts that may affect the development of Viet Nam’s economy. The big question raised now is how to make the most of all the opportunities, especially those brought about by the fourth industrial revolution, overcome the difficulties and challenges, clarify new drivers of growth with a vision of development in the new era associated with innovative and reformed thinking so as to find out the best alternative for the growth and development puzzle of Vietnam, towards exceptionally rapid growth, rapid and sustainable development on the basis of making full use of scientific and technological achievements of the humankind, making Vietnam become a modern industrialized nation with advanced market economy and sustainable development in which human development is the priority, ensuring the attainment of the goal of prosperous people, a strong country, a democratic, equitable and civilized society. Given the Fourth Industrial Revolution which is taking place rapidly and has exerted profound impacts on all aspects of the social and economic life of all nations around the world, created dramatic changes, from changes in organization of production, supply of services, methods of business doing, to those in consumption styles, ways of communication and even human being, we are facing the historical requirement for strong and fundamental renewal and reform in order to continue to grow and to move up. This is because without performing reform and development at the same time, we will immediately lag behind the era. This is the "golden" moment as we are offered valuable opportunities, opportunities in the high proportion of working age population, and increasing rate of trained workers, deep and wide international integration, ability to access and utilize the Fourth Industrial Revolution, increasing investment flows from developed economies, multinational corporations and transnational corporations into developing countries and emerging economies, etc. According to Minister Nguyen Chi Dung, in order to do this, we need to be aware of the difficulties and challenges to be tackled in the coming time, especially those regarding the relationship between reform and development, in both perception and action; to be able to predict and respond to the adverse effects of the Fourth Industrial Revolution in which we are required to:on the one hand, discover and make the most of the opportunities brought about by this revolution, in the area of technology in particular;improve the sub-indexes of Viet Nam's innovation index, especially in terms of legal environment, business environment, infrastructure, access to information and communication technology (ICT); mobilize fully all available resources for development, especially those from the private sector, and the high quality human resource; develop a dynamic, efficient and globally competitive private sector which must become an important driver of the country’s economic growth; create alignment and cooperation for mutual development between domestic and foreign businesses; effectively respond to the impacts of climate change; properly solve social problems, ensure sustainable development, etc. ; and, on the other hand, minimize the challenges and adverse impacts of this revolution, especially the increasingly widespread use of robots in replacement of humans. Based on a clear identification of where the economy stands in the process of development, recognition of the difficulties and challenges, and identification and making the most of all opportunities, even the smallest, for reform and development, even the smallest, for reform and development, we need to focus on identifying the most important drivers of growth and development in which the foundation driver of growth for the Vietnamese economy is the institutional reform in combination with concentrated efforts on improvement of labor productivity, efficiency and competitiveness of businesses through suitable and effective policies and solutions, particularly those to promote high-tech applications; development of the private sector in close cooperation with the foreign-invested sector; human resource development which is the determinant for the success and effectiveness of all other drivers. Speaking at the Forum, WB Director Ousmane Dione said that this annual forum is the succession of the Viet Nam Development Forum (VDF), Vietnam Development Partnership Forum (VDPF), Vietnam Consultative Group Meeting (CG Meeting) which has been held annually for the past 25 years since the first CG Meeting in Paris in 1993. At the same time, he highly appreciated the remarkable achievements of Vietnam. Over the past 30 years, Vietnam's economy has expanded at an average of nearly 7% per year, per capita income has increased nearly five times. Vietnam today has emerged as a thriving lower middle-income economy and a thriving export country. Vietnam's growth is also inclusive, with poverty falling of just below 7%, compared to more than 60% in the late 1980s. 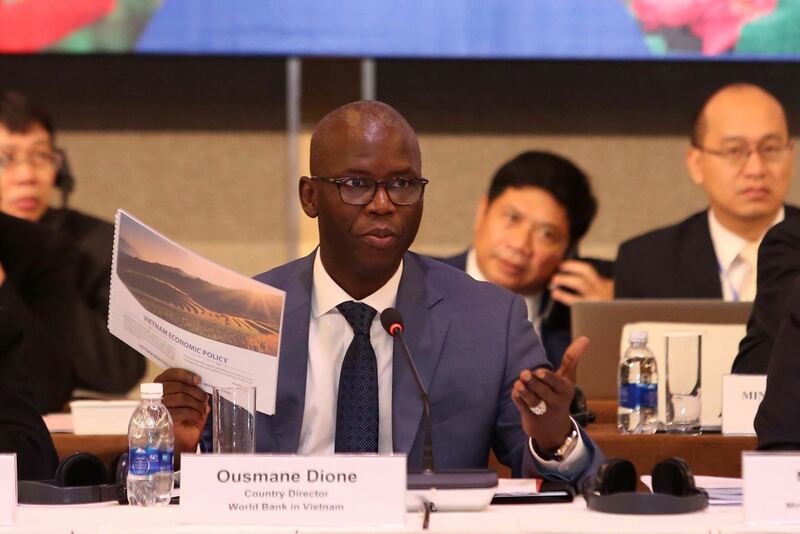 From the results achieved, the Director Ousmane Dione proposed four key priorities for Vietnam. First, reforms to promote domestic private sector development will need to be significantly stepped up, making it a primary driver for productivity improvement and economic growth. At the same time, the reform of state-owned enterprises should focus on the adoption of international best practice in governance. The attraction of FDI should also shift away from quantity to quality with a focus on high-tech and high value-added as well as harness stronger linkages between domestic and foreign firms. This would help the domestic private sector effectively join the global value chains. Second, Vietnam needs to continue investing in infrastructure, which is critical for future growth.Attracting private investment can be a great help in meeting the high investment needs of Vietnam. Third, investment in human capital is essential, especially in the context of fast-changing disruptive technologies and the Fourth Industrial Revolution; it is required to focus on the quality and relevance of higher education and vocational education, etc. Fourth, managing Vietnam’s natural assets and building resilience against climate change is crucial for sustainable growth in key sectors, such as agriculture, food processing, and tourism. Besides the above four priorities, according to Director Ousmane Dione, Vietnam needs to build capable and effective state institutions, because effective market institutions and a transparent, clean and accountable state are fundamental for development. Moreover, as Vietnam has become a middle-income country, development challenges are increasingly sophisticated and cross-sectoral in nature. Therefore, effective coordination across ministries and agencies as well between central and local authorities are now more important than ever. In addition, improving domestic revenue mobilization, complemented by efforts to enhance expenditure efficiency and debt management capacity will be important to ensure development objectives can be achieved without raising debt to unsustainable levels. Along with that, ODA resources need to be used in a more effective and strategical way to supplement domestic public resources and aim to leverage non-financial benefits, know-how, and private investment. At the Forum, Minister Nguyen Chi Dung and Director of Ousmane Dione announced the Vietnam Economic Policy Framework with a clear message of determination to build a State of tectonic development, action and integrity to continue boosting the innovation process, improving the business investment environment, mobilizing resources for development to jointly build a flourishing, prosperous, harmonious and sustainable country for Vietnam. In the framework of the Forum, there were discussion sessions with titles of "Vietnam's vision in a rapidly changing world", " New growth driver: Creative innovation on the industry 4.0 platform" and "Development of Private sector". Speakers will discuss the opportunities and challenges facing Vietnam in the context of a rapidly changing global economy and the actions that Vietnam needs to take to overcome these challenges and reach to its aspirations. At the same time, they present the barriers, the gaps between Vietnam’s technology of production and the 4.0; policies to promote creative innovation and technological science in the context of the Fourth Industrial Revolution in Vietnam, creative innovation through cooperation between industry and universities./.